Submitted by Jeff Buster on Sun, 03/17/2013 - 22:05. This afternoon I visited the site of a global warming experiment installed (outdoors) in 2006. The experiment studies plants to determine what species will advance, and what species will recede, as the average temperature increases. To do this, electric heaters are used to increase in various increments the ambient outside temperature over the plants - sort of like putting a spot light (without the photosynthesis light) on an outside plant to keep it warm. The experiment also takes into account increases and decreases in precipitation - by artificially increasing and decreasing the natural precipitation at the site of the experiment. The experiment is housed in an area of aproximately one acre and has an open green house like structure over head. 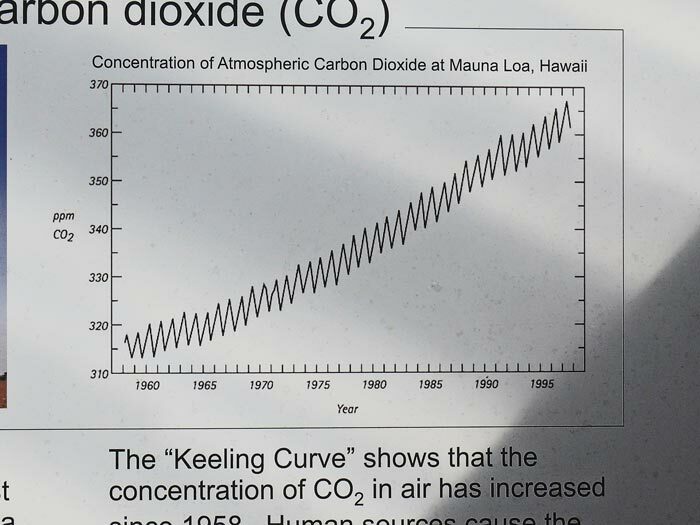 I was not familiar with the "Keeling Curve" (image above from experiment's information display), so when I got back on the internet I googled Keeling Curve. Wikipedia explains that since1958 a scientist in Hawaii has been tracking atmospheric carbon dioxide concentration. (good place to do it - Hawaii - as there is a prevailing easterly wind there and little problem of test contamination from locally produced CO2). You can read about Mr. Keeling's study here on Wikipedia.